b) Where it does show the diffences is I)he'd be less depeond on others thanks to the fact primairly we're a much rich societey (though it's good that even in the Victorian era he ultimatley found someone who was wililng to subsidise him- i doubt that would have been true 100 years before) and most of all I iaminge now they'd be the technology to give him an operation to make him look better even if not exacly well poor chap. The source is a biography of him that I've just read- unfortunately its not an academic historian but a medical doctor who wrote it but his use of the sources is I think pretty good and he is transparant about what he can say on the basis of them. B is true I suppose- I was thinking of contemporary Britain where fairs are much less important than they are today. During Merrick's lifetime there is evidence that they were slowly dying out- especially given their overwhelming earlier populatiry. The second point b yes we are much richer- but also there is a much more sympathetic safety net out there- workhouses were not sympathetic places to be. c possibly- but I think that was the product of his isolation and I don't think that attitude was a healthy or a good one to have. Much better judge women as they are- as human beings- than as aethereal creatures. 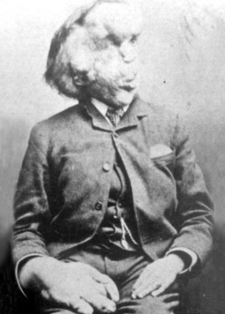 Several times since 1980 I've watched the film with John Hurt as 'The Elephant Man'. Moving! And lots to learn for those who would call themselves 'normal'. Interesting post, to which I have linked. there's also of course the important point that the poor in the Victorian era were much poorer all but the very poorest in strictly material terms in the UK today. I should have added for attitude to women that this was less likely given no effective contact with women - a very important addition! I think there is something in the argument that there is a culturally relativistic way of looking at this. In that the poor were treated awfully in the Victorian era- but that's in the context that today as a society we are much richer. I don't buy it entirely- I'd be interested in how that figure of 10% was arrived at and to what extent that went to the poor or to charity (different things)- if its to the poor that would mean that hte Victorian middle Class were spending say 20% on charity! A very big number indeed.